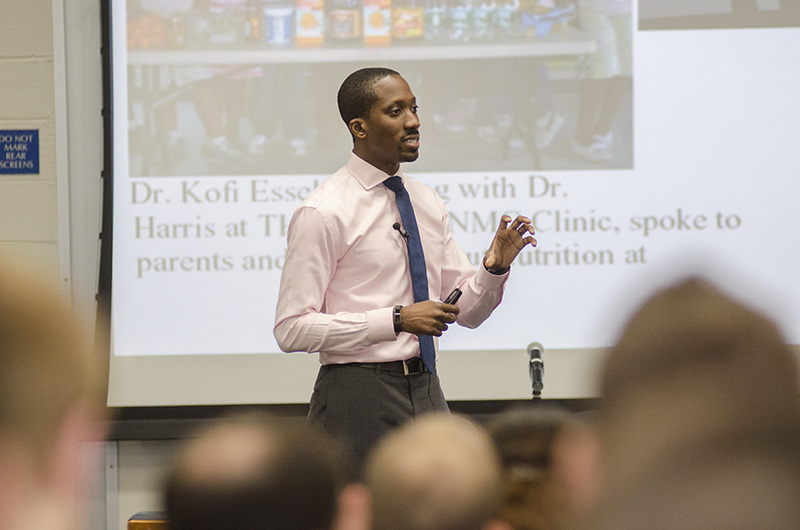 Even as a young child, Kofi D. Essel, MD '11, MPH '17, FAAP, was drawn to medicine. His interest in the sciences, a mom who was a nurse, and the need to manage his food allergies and asthma so he could excel in sports combined to put the young Dr. Essel on his career path. He uses those early lessons and the training he received at both the GW School of Medicine and Health Sciences and GW’s Milken Institute School of Public Health in his work in the Anacostia neighborhood of Washington, D.C. as a board-certified community pediatrician at Children’s National Health System. Growing up in a single-parent multigenerational immigrant family in Little Rock, Arkansas with limited knowledge of important resources, Dr. Essel recognized the unique experiences, challenges, and disparities that shaped his background, and is using them to more effectively care for his patients. “I wanted to see what I could do to improve access for others when I became a doctor,” he says. Dr. Shields, who is now vice president of medical affairs at Holy Cross Health Network, was impressed by Dr. Essel as a student and now values him as a colleague. “As I have witnessed his professional growth over the years, he has been unwavering in his commitment to the health of the community, to academic growth for himself and his peers, and now as a mentor for medical students and residents,” says Dr. Shields. In addition to his work in the community, Dr. Essel is active at GW where he serves as an assistant professor of pediatrics, director of the Community Urban Health Scholarly Concentration, a key member of the school’s Clinical Public Health team, and director of the Clinical Public Health Summit on Obesity for second- and third-year medical students. This article originally appeared on GW Alumni News. Boston.com's Child Caring - How to Explain Mom's Long-absent Mother?